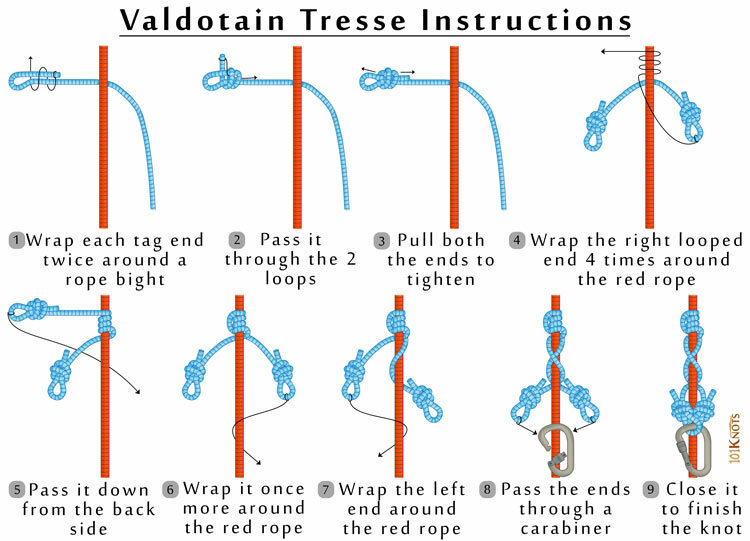 The Valdotain Tresse, Vallard Tresse or VT knot is mainly used by climbers to ascend and descend ropes by friction. It was originally used in Alpine rescue from where it graduated into a popular arborist knot. This is not for beginners. It is very important to tie it correctly in critical situations since its failure may cause death, injury or severe damage to property. A specialty of the VT Prusik is that it can be released under load. 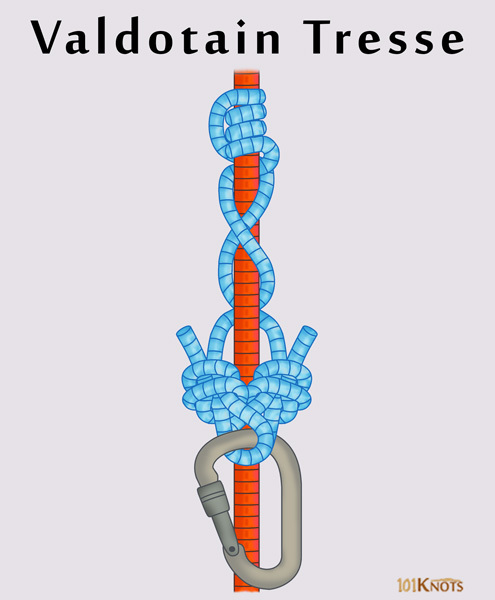 This knot can be made with a rope having 2 sewn eyes (also known as a spliced eye, split tail friction cord) or hand-tied loops (procedure shown below) at its ends. It is the blue rope in the below diagram. The red thicker one is the main climbing rope. The loop knots made at the two ends of the lanyard by the steps 1-3 are poacher’s knots. You might have to test the grip effectiveness of the knot with different lengths, diameters and materials of friction cords. For example, one that is too long cannot grip instantly when it is pulled down. Working it with a micro pulley tends the slack as the tail of the climbing rope is pulled. To attach a carabiner to a climbing rope. In technical rescue and canyoneering.